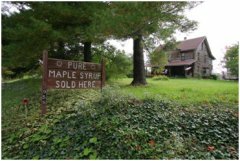 Stroup’s Pure Maple Syrup is located at 958 Lindholm Road, Pennsylvania, near the Kinzua Bridge State Park and the village of Mt. Jewett. This delicious Pennsylvania maple syrup is produced on their farm, with an annual production of about 150-300 gallons. The maple syrup is collected from over 700 maple tree taps and the evaporating syrup is done yearly in late February and during the month of March. 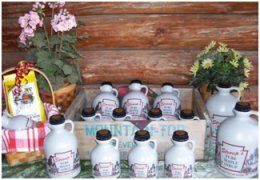 You can purchase Stroup’s Pure Maple Syrup at the South Bradford Fruit Market in Bradford and directly from their farm located along the Kinzua Bridge Scenic Byway. Weekdays & Weekends when they are home! * Located between the Kinzua Bridge State Park and Mt. Jewett, Pennsylvania. Please use this road location for GPS driving directions as mailing address and physical address are in different locations on the map.